My article in Horticulture Magazine! 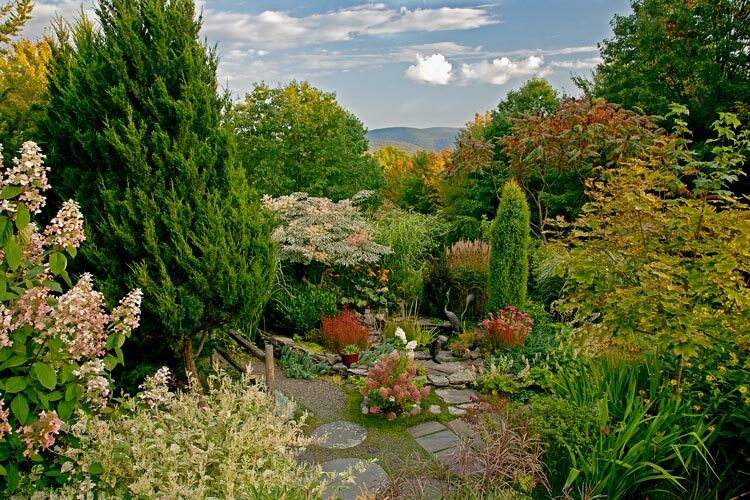 This photo of Mel’s garden appeared in the article. A masterful profusion of color and texture! Mel’s personal garden in Andes was always a source of inspiration, wonder and awe — the plant layers, curving paths leading to hidden seating areas, nuances of varying hardscapes, sweet little personal details and tall Alice in Wonderland plants that enveloped me. His garden was a total immersion in an experience of textures, flowers, scents, secret places. Similar to when, as a child, I lost myself in woodlands or meadows and my feet were on this earth but my sense of experience was blissfully in nature and not in the mundane adult world of jobs, bills, politics and now — environmental and humanitarian horror. In recent years, I started contributing articles to Horticulture magazine and when the editor put out an open call for submissions — I pitched a profile of Mel’s garden in Andes. My pitch was accepted! Surprising Mel with the news and hearing his disbelief and happiness was one of the best feelings. Even better was to open my mailbox and see the article and Mark Loete’s photographs (markloetephotography.com ) in print for the whole gardening nation to see. Being able to give Mel national recognition for his horticultural passion and expertise has been one of the great pleasures of my own career as a garden designer and writer.